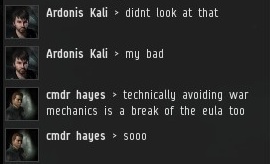 Previously, on MinerBumping... Rebel cmdr hayes thirsted for vengeance against the New Order, but his revenge plots fizzled, one after the other. 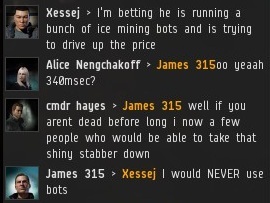 As you might have guessed, hayes put aside his plan to hack MinerBumping just as quickly as he had picked it up. Fortunately, he had a new plan: Background research. 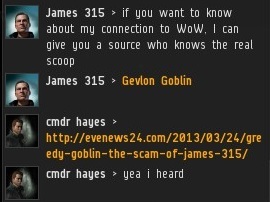 hayes' efforts to use information from my WoW days ran aground when it turned out that I've never actually played WoW. I decided to lead hayes on a wild goose chase, but hayes was on the scent of multiple geese already. Conspiracy theories sprouted in local. 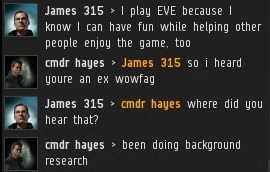 EVE players are cynical these days--they don't get that sometimes a dude does good deeds because it makes a dude feel good. Meanwhile, hayes posted dark hints about knowing some people who could kill my Invincible Stabber. hayes switched gears mid-plot, encouraging people to mass-petition me. It was like watching a movie of old anti-Order rebellions in fast-forward. The madness was taking its toll on everyone. It was impossible to keep up with all of hayes' schemes. 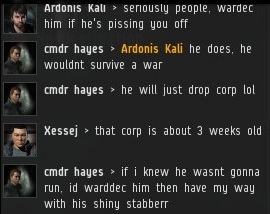 Earlier, hayes had suggested a wardec might do the trick. That plan was long dead now. Just like that, a brand new idea popped into hayes' head. The life expectancy of hayes' revenge plots could only be measured with a finely-crafted stopwatch. I'm accustomed to getting notifications about people setting standings to me. I'm a bit of a polarizing figure in EVE, so usually I'm either being set to "Excellent" or "Terrible" standings. hayes is one of the only people ever to set me "Neutral". I guess as he bounced from one idea to the next, hayes felt he had to keep his options as open as possible. 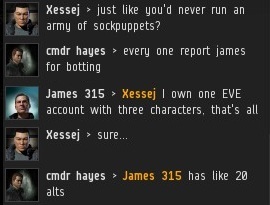 LOL that cmdr hayes dude seems a bit...mental. I'd be honored to get my baptism by Concord on him, as soon as my new ganker toon can fit 8 LNB Is on my Cat. Come not between the butthurt carebear and his aspirations for e-vengeance! You will only find more hilarity. "... when I'm in command, every mission's a suicide mission." Kind of fitting for our brave Knights. "Sir, we're on beige alert." "If I don't survive, tell my wife, "Hello""
Can't wait for Part 3 of this one. I've got US$20 on 'he'll think up more than eight harebrained schemes before he gives up'.